That sound coming from your computer could be its cry for help. When was the last time you cleaned that thing? Seriously, though, cleaning the outside of your computer is just as important as making sure your computer’s up-to-date and virus-free. More than its aesthetic value, a clean computer is a well-performing computer. Sadly, not all PC users realize the many benefits of keeping their computers physically clean. This is why some people end up with a pile of dust build-up that’s difficult to get rid of. Regularly cleaning your computer will help you in the long run and here are more than a few reasons why you should start doing it now. More than just having a sense of accomplishment, cleaning your computer has a lot of great benefits. Saves Money – By making sure that your computer is always clean, you don’t have to worry about spending a buck on maintenance and repairs. The cost of having someone else do a simple task that won’t take too much of your time to do on your own is additional money that you can save. Times are tough! Enhances Computer Performance – Imagine walking around with ten layers of clothing. It’s difficult, isn’t it? The same goes for a computer with a huge buildup of dust and grime. For one thing, the fans won’t be able to run smoothly if there’s dirt blocking its way. This affects cooling, of course. Without a proper cooling system, this could cause your system to overheat. Overheating can cause tons of other, more complicated problems. It can potentially destroy the components of your computer. If you spent a lot of money on those parts, losing them to dust is hardly the right way for them to go. Additionally, if your computer is physically clean, then all the parts remain clean and healthy, too. Your computer components don’t break easily, so you don’t need to replace them as often as you would if they broke down easily. Additionally, when you clean your computer, you get to watch out for any parts that might need additional attention. Helps with Productivity and Hygiene – No, it will not magically make you want to work with gusto, but it certainly helps you focus. For one thing, you won’t be hearing your computer overexerting itself while you do your work. It’s one less thing to worry about. Also, wouldn’t it be nice to just glance over to your computer desk and see that it’s running smoothly? It just makes using it all the more appealing. Moreover, you don’t really want to end up sick because your work station is filled with dust. If you’re wondering how often you should do it, you need to evaluate what type of environment you’re working with first. For instance, if you have pets or if you smoke, you might need to clean your computer once a month. However, if you keep a generally clean workstation and regularly clean your room, then you don’t need to clean your computer as much. You can maybe get away with cleaning once every 3-6 months. One thing you must note is to NEVER spray any form of liquid into your computer. This will destroy the circuits. If you need to use liquid like rubbing alcohol or water, do it by using it on a cloth first. Also, don’t touch any knobs or buttons that you don’t know anything about. Other than that, be sure to always check if your PC is heating up more than usual or if you believe it’s too noisy due to some buildup of dirt inside. 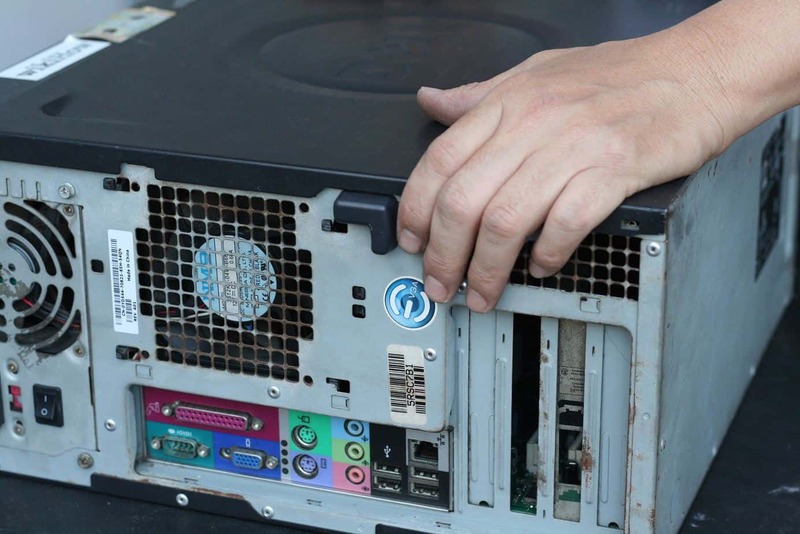 Compressed air in a can – The inside of your computer can have a lot of dust buildup and simply brushing it off just won’t do. There are several hard-to-reach areas inside the computer case that only a narrow tube can get to. This is not mandatory, however, but it will save you a lot of time. This’ll blow out the dust particles at a much quicker time. Screwdriver – You’ll be taking apart some of the components of the PC and the best way to go on about it is with the use of a handy screwdriver. This will help you remove the cover on your casing, and take out some of the parts on your PC that might be in the way of your cleaning it. Cleaning Cloth – Using a cloth is a nice finishing touch after you’ve gotten everything out of the way. It keeps the parts of your PC looking neat and polished. Soft brush – A brush is always a handy tool when you’re cleaning up. If you can get a smaller brush, much better. This will help you brush off dust on the surface. Q-Tips – These can be lifesavers when you’re cleaning something. Some nooks and crannies are very difficult to reach and there might be no parts to remove for you to gain access. If you’re not going to get a can with compressed air, then Q-tips is your best bet. Stock up and get swabbing. Screen Cleaning Wipes / Microfiber Cloth – Don’t use any ordinary cloth for cleaning screens if you want them to remain scratch-free and clean. Ordinary cloths have fibers that can potentially scratch the surface of your screens and they’re not very effective in removing dirt, especially on computer monitors. 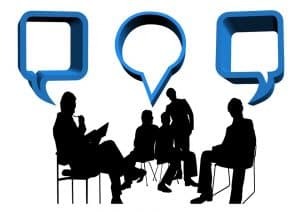 Let’s get this out of the way, since it’s the most important part – and the most time-consuming. The computer hardware consists of the computer tower and everything that goes inside it. This includes the case, the processor, graphics card(s), motherboard, and the power supply. Please note that this guide is for desktop computers. Now that you have everything you need, you can begin cleaning. Step 1: Turn everything off and unplug anything that’s connected to the power outlet. Disconnect everything from the computer tower. If the cover is screwed in place, use the screwdriver then carefully take it off. Alternatively, some screws can easily be removed by hand. Be careful not to pull too strongly on it if fans are attached as this could damage the wires. Step 2: Using the brush, remove any dust from the cover. Then, using the can with compressed air, blow out the dust collecting in the fans. To do this, be sure to hold the blades of the fan while you’re using the compressed air because not doing so could damage them. Brush off any of the dust that was blown off. Step 3: Using damp Q-tips, wipe the areas in between the fan blades for dust and dirt that might have gotten stuck there. The motherboard doesn’t require that much upkeep. Simply blow out the dust and wipe it off with a cloth, making sure to pay extra attention to the gaps between the various components on it. You can even just make do with a soft brush since the gaps are not that big between the parts. Step 1: Using a screwdriver, carefully remove the graphics cards from the motherboard and off the case. PCIe slots have a safety measure that seals the graphics card in place. Make sure it is unlatched before removing it. Step 2: If you’ve got a graphics card that has its own fan, then you can just as easily do the same process with the fans and vents on your computer case. Again, be sure to hold the blade in place while you’re blowing away the dust. For a more thorough cleaning, clean the area between the blades with a Q-tip. Step 3: Don’t put the graphics card back to its original place just yet. Let’s save that for later, after everything’s been cleaned. Instead, give it a good wipe with a dry cloth to finish off its cleaning process. Do this gently, so as not to damage the circuits. There are a couple of ways for you to do this. You can choose to either remove it from the case. Step 1: If you do decide to remove it from the case, secure the blades of the fan before using the compressed air can. Otherwise, find some way to secure the blades from the outside. Using the compressed air in a can, blow away the dust and make sure you go at it from all angles, especially if you won’t be removing the power supply. Step 2: After thoroughly getting the dust buildup out of the way, use a Q-tip to get rid of the more stubborn buildup between the fan blades. You’d be happy to know that the peripherals of your computer are so much easier to clean than the inside of the computer. The peripherals include the monitor, keyboard, mouse, and any other thing attached to your computer. Using the same tools mentioned above, let’s get started with the cleaning. It’s time to put the screen cleaning wipes to use. These sheets have microfiber that treats your monitor gently. 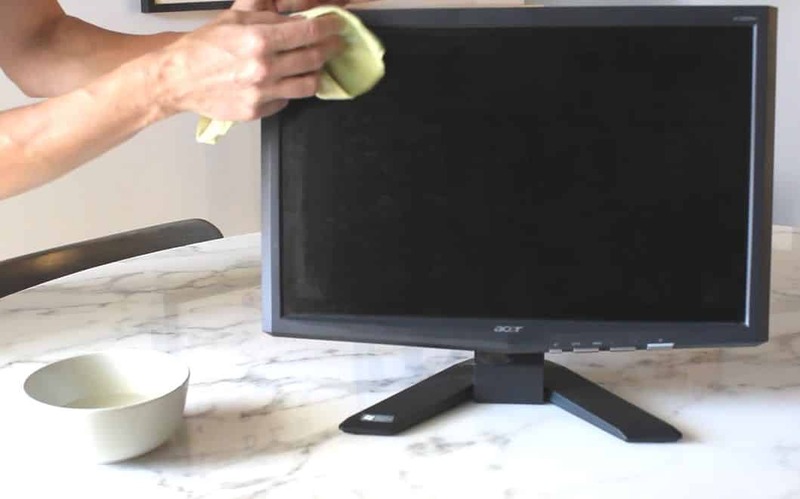 For more effective cleaning, use rubbing alcohol on the wipes so that you can really remove the dirt that’s been building up on your monitor. Step 1: Without alcohol or water, wipe away the dirt off your monitor. Take the microfiber cloth and just wipe across the screen and at the back of the monitor repeatedly. If you’ve been cleaning your monitor regularly, this’ll usually do the trick. Step 2: If it doesn’t do the trick, then put some rubbing alcohol on the sheet and repeat the wiping process. Be careful not to apply pressure on the monitor, particularly on the screen. You might end up with a squeaky clean monitor but with damaged display. Simply go over the dirty area repeatedly. Step 3: Wipe it dry with an ordinary cloth. You don’t want to leave your monitor wet because when the liquid dries, it could leave marks that would get in the way of the monitor display. Step 1: Flip and hold the keyboard upside down. Using your compressed air in a can, blow out the dust in the space between – and underneath – the keys. This is probably a really satisfying step if you haven’t cleaned your keyboard in a while. 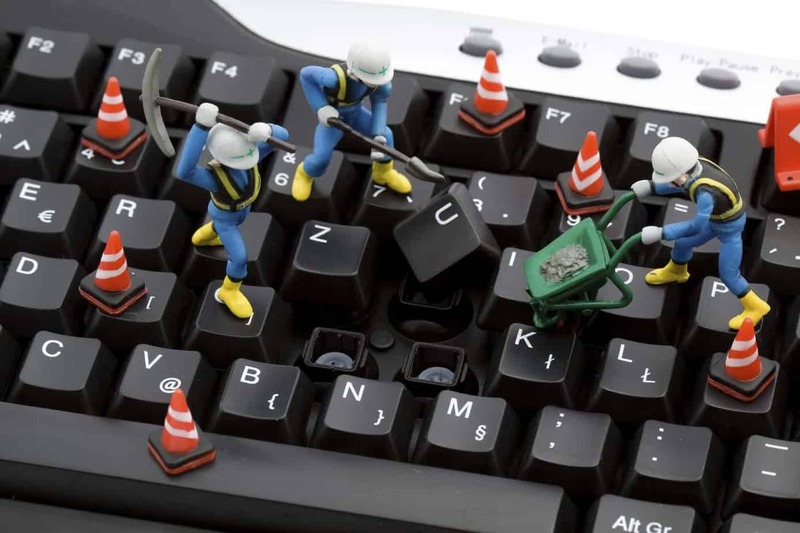 You’d be surprised how much dirt is collected underneath your keyboard keys. Step 2: Still holding it upside down, get your soft brush and go over the keys with it to get rid of the dirt that have managed to get out from under the keys. If you want to take it up a notch or if you really haven’t been cleaning your keyboard in ages, you can dislodge the keys and swab the keyboard with damp Q-tips. Now, we’re down to the easiest part of cleaning your computer. There’s no need to even enumerate the steps because all you’d need to do is wipe it clean with a damp cloth. Soaking the cloth in alcohol will do the job. For other peripherals like the headset and speakers, simply clean the outside with the damp cloth and you’re good to go. Pay close attention to the headset because a lot of germs and bacteria are collected in it. Clean this more often than the other parts of the PC. If you can, make sure you wipe it clean everyday. A lot of people skip cleaning their computer, thinking it doesn’t really have a long-term effect on them. Surely, you’ve already seen a few computers that look worse for wear, with thick layers of dust covering every surface possible. Just like any machine, you need to be able to perform regular maintenance and upkeep so that it keeps running the way it should. A messy computer not only hinders its performance, it also costs you more money in the long run. Always make sure your computer is clean so that you can make sure that it’s always performing its best.